I hear you – the flags of everything Bourbon and Sour Mash are in most people’s minds thoroughly planted on terrain in the South of the new world. Terra australis has not only emerged on the world map of quality spirits but continues to consistently create drops that push the envelope, which boosts demand beyond of what most of the small distilleries can supply. Limeburners based out of Albany is one of the hoocheries that I have yet to taste an expression from that does not leave me smacking my lips. Needless to say that I was excited when I became aware of the fact that the entity behind Limeburners, i.e. The Great Southern Distilling Company, have tried their hand in creating a Sour Mash whisky that is based on the traditional Tennessee approach, i.e. barley, rye and corn being the base components, the Tiger Snake Sour Mash Whiskey is another standout in a line-up that has hardly any weaknesses. In the most smooth and subtle way aromas of vanilla, malty and nutty nuances hit the nose once the cork is popped and a sweetness unfolds on the palate that is not intrusive but informed by high notes of honey, caramel and oats. The elegant finish that whispers insistently “Pour me another dram” is creamy in nature and is a microcosm in itself in which toffee and vanilla play prominent roles. I have yet to experience the full range of Limeburners’ expressions, however, this one has instantly catapulted itself to the forefront of my favourites. Given the quality of the excellent whiskies coming from Limeburners paired with my weak spot for Boilermakers, the announcement of the Pirate Life / Limeburners Whisky Barrel Aged Stout 2018 collaboration got me mildly excited. With beer and whisky both sharing a DNA of malt and water, the coming about then starts to come to a crossroad. What is interesting about the Pirate Life / Limeburners collaboration is that both find together again creating a total that is much more than the mere sum of its components. Truth be told, I am usually not big on Stouts or dark beers and was a tad sceptical about how this one would turn out as I immensely enjoy both Pirate Life’s IPAs and Limeburners’ whiskies. 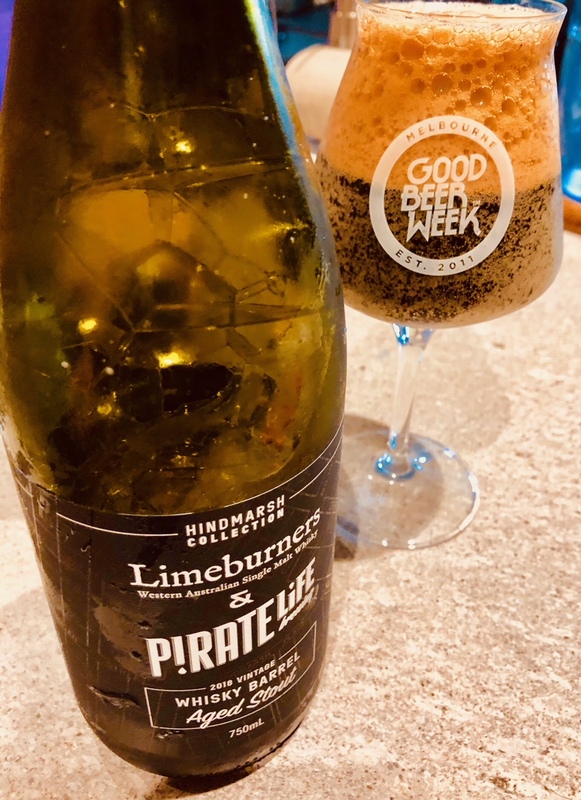 Pirate Life / Limeburners Whisky Barrel Aged Stout 2018 is a complex and sublime exercise in somehow marrying a heavy and decadent Stout that has surprisingly sweet notes with the best parts a Limeburners barrel has to offer, i.e. dominant vanilla notes, piney flavours, chocolate and honey. Not unlike a delightful whisky, this one is one to hit the pause button for, kick back, let it warm in your glass and let it unfold its surprising highs.